After the stress of a wedding, a perfect honeymoon destination is just what a newlywed couple needs. In this list we combed the globe in search of picture-perfect honeymoon destinations. And, because not every newlywed has the same idea of a perfect honeymoon destination, we have compiled a variety of destinations. You will have the options between warm and cold, as well as peaceful and active. After you decide on your perfect destination. Make sure you visit our list of the best travel websites to plan your trip and best travel accessories to make sure you have everything that you need. Bernard Shaw once described Dubrovnik as Heaven on earth, and no wonder, this warm, picturesque Mediterranean location is truly heavenly. Dubrovnik boasts beaches, lovely seaside villas, and an old town. It is perfect for exploration without the crowds typically associated with the Mediterranean. Situated in the Gulf of Thailand, Koh Samui is Thailand’s second largest island. Pristine beaches – both tranquil and party orientated – abound on the island. And, the inner mountainous rainforest of the island makes for a dramatic backdrop. Culture and entertainment also abound here. There are a number of temples, resorts, spas, restaurants, and natural beauty that awaits visitors of Koh Samui. Also, there are a variety of activities to choose from as well. Snorkeling and diving, as well as a range of other water sports, are readily available on the island. The Amalfi Coast is a 50-kilometer stretch of coast along Italy’s southern Sorrentine Peninsula. Up and down the coast you will be able to get postcard-perfect views. Intimate beaches are backed by rugged cliff lines, while colorful fishing villages dot the shoreline. Spas, villas, fine dining, and more can also be found along this shoreline as well. This is the perfect honeymoon destination for those looking for something extra special. The honeymoon destination of John and Jackie Kennedy, Acapulco has both a boisterous and tranquil side. So those looking for action will appreciate the nightlife and water sports. While those who are looking for peace and tranquility will appreciate Acapulco’s top-notch spas and wellness services. Located in the north-west of New Zealand’s South Island, Nelson is the sunniest region in New Zealand. Draws to the area include the crystal clear waters of New Zealand’s largest freshwater springs, the sun-soaked sand of Golden Bay, and the famed Abel Tasman hiking track. Local vineyards and a full range of accommodations round out Nelson’s appeal. Iceland is a country filled with lagoons, waterfalls, and beautiful landscapes. There is natural beauty pretty much everywhere you look. Reykjavik is the capital and would make an excellent starting point for your honeymoon. From Reykjavik, there are also several day trips that you would have access to as well. The Blue Lagoon, The Secret Lagoon, Gullfoss Waterfall (one of the best waterfalls in the world), and Thingvellir National Park, are just a few. Another great way to travel in Iceland is by road-trip. Highway 1 circles Iceland and will allow you to move freely around this one of a kind country to stop and sightsee at your pleasure. Tuscany offers something for everyone. You can stay seaside, in the mountains, a remote countryside, or in the hub of a town or city. We recommend some time at each of these while in Tuscany if possible. With so much history and beauty all in one location, it is easy to see why Tuscany would be a great honeymoon option. Cork County abounds with scenic countryside, islands, lighthouses, cycling, and sailing. It is also home to the famous Blarney Castle and Blarney Stone. Outside of sightseeing, Cork County is also home to many gourmet food destinations. So if beautiful scenery, excellent food, and interesting history appeal to you, Cork County may be the perfect honeymoon destination for you. About the size of Britain, but with far, far fewer inhabitants, the Chilean region of Patagonia is a breathtaking wilderness area. Activities include fly-fishing, trekking, cycling, mountain climbing, rafting, kayaking, and horseback riding. Majestic lakes, fjords, glaciers, and century-old gaucho villages round out Patagonia’s appeal. It is hard to picture anything but a fantastic time when you are in a tropical paradise like Saint Lucia, especially on your honeymoon. You will get access to crystal clear water, soft sand beaches, amazing ocean and island views, and resorts that exist to spoil you. Located in the Eastern Caribbeans, you will not be disappointed with the small island nation of Saint Lucia. Paris doesn’t need much introduction as it is the top visited destination in the world. If you enjoy history, art, fine dining, and sightseeing though, “The City of Light” is an excellent option for your honeymoon. There are also some great Paris honeymoon packages out there as well. These packages will help take the stress out of your trip and allow you to enjoy the culture, sites, and of course your significant other. This honeymoon destination may be a little bit more remote than some of the others on this list. However, once you get there though, it will have been entirely worth the extra travel time. Bali is known as the “Isle of the gods” and has many temples and religious sites full of Indonesian culture. The island is also going to have unique beaches that are some of the best in the world, perfect for enjoying with the love of your life. The Fairmount Chateau is located in Alberta’s Banff National Park. Inside the hotel, you will have everything you could need to enjoy your honeymoon. The real treasure though is just outside the hotel. The Chateau is surrounded by Lake Louise and soaring mountain peaks. Depending on the time of year there are a variety of activities you will be able to do as well. You will be able to hike, ski, canoe, ice skate, snowshoe, mountain bike, fish, and more. Referred to as the “Valley Isle,” the Hawaiian island of Maui is the perfect blend of beaches, jungle, and quaint towns. Other island draws include superb farm to table cuisine and prime viewing for humpback whale migration. It is hard to picture anything but a perfect honeymoon on the island of Maui. Bora Bora is known the world over as an acclaimed honeymoon destination. The resort offers iconic overwater villas that provide residents with a mini oasis. In between villa lounging, Bora Bora also boasts a number of water activities as well. You will be able to enjoy snorkeling, diving, parasailing, fishing, paddle boarding, and more. There are not many more beautiful places in the world than the Italian coastline of Cinque Terre. The area consists of five different villages. The villages are Monterosso al Mare, Vernazza, Corniglia, Manarola, and Riomaggiore. This region of Italy is visited by honeymooners from all around the world. And, with each village having a slightly different feel, you will be able to find the perfect fit for you. We recommend that you try to experience a few different villages while you are in the area. Located in the Southeast corner of France, Nice is situated in the French Riviera on the Mediterranean. As a former retreat for 19th Century European elites, Nice is going to be filled with elegant architecture and history. Add in amazing beaches, views of the Mediterranean, fine dining, and a happening nightlife, and you get the perfect honeymoon destination. The Oregon Coast is filled with beaches, overlooks, mountains, lakes, and much more. All this will allow you to be as adventures as you would like. Whether you are looking for a cabin in the woods or a resort location on the beach, the Oregon Coast is going to be able to satisfy. There are a number of great places on the Oregon Coast worth visiting as well. You have Multnomah Falls, Edgefield Resort, Willamette Valley Wine Country, Ashland, and Crater Lake. These destinations will help you with base points for your honeymoon on the Oregon Coast. An awe-inspiring sight, Victoria Falls is one of the best waterfalls in the world and a once in a lifetime destination. Outside of the views, there is also a number of activities you can take part in as well. There are horseback safaris, bungee jumping, gorge swinging, canoeing, and more. The beautiful and wild world of Zimbabwe makes for a memorable honeymoon. Charleston, South Caroline is Southern charm at its finest. This romantic city is consistently ranked as one of the top locations in the world. With a number of charming bed and breakfasts, as well as top dining, beaches, and nightlife, Charleston is a great honeymoon destination. Everyone has different tastes, even when deciding on a honeymoon. This list of the best honeymoon destinations will cater to those different preferences. 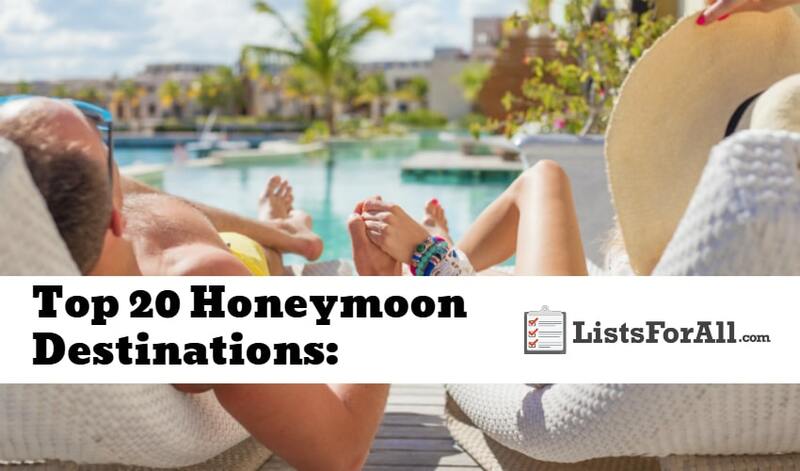 With the variety offered on this list, you should be able to find a honeymoon that speaks to you. Another great honeymoon option is a cruise. If you are considering a cruise, make sure that you visit our list of the best cruise lines. You will be able to find the perfect cruise line and destination for you. Have you been to any of these destinations? If so, we would love to hear your feedback on them in the comments below.